RYE, NY--(Marketwire - April 13, 2010) - TomoDirect™, an efficient new way to deliver high quality radiation therapy treatments for breast and other cancers, is being offered for the first time in the New York area at the Institute for Image-Guided RadioTherapy (IIGRT) of Westchester in Rye, N.Y. To visit their website, go to www.instituteigrt.com. "For breast cancer treatment, we see great potential with TomoDirect™ delivery," said Dr. Daniel Fass, director of IIGRT. "We expect that TomoDirect™ technology will significantly reduce delivery time for treatments, while effectively sparing the heart, lungs and healthy breast tissue." One key area of utilization of TomoDirect™ at IIGRT is anticipated to be in delivery of "accelerated partial breast irradiation," which can dramatically shorten the duration of a course of radiotherapy after breast conservation surgery. Another application is simultaneously delivering a conformal "boost" dose to the area of surgical removal during whole breast radiotherapy. TomoDirect™ is a new radiation therapy delivery mode developed by TomoTherapy Incorporated for use on its innovative image-guided radiation therapy system. (Besides the Rye location, the closest location to the NY metropolitan area that offers this advanced radiation treatment is located in Milford, Pennsylvania at the Upper Delaware Valley Cancer Center). The distinguishing feature of TomoDirect™ is its efficiency in applying multiple carefully-directed radiation beams to the targeted region of the body. Each beam is designed to safely contribute to this area a planned amount of radiation dose. The TomoTherapy® system, which also offers a continuous 360-degree delivery mode, has been installed in more than 250 hospitals and cancer centers worldwide since its introduction in 2003. The system has emerged as the 'gold standard' for effectively treating a wide range of cancers -- including the most complex cases -- with highly-precise tumor targeting and reduced radiation exposure to healthy tissues and organs. IIGRT first introduced TomoTherapy® technology in 2007, and Dr. Fass has treated more than 600 patients in his Rye radiation oncology center with this advanced radiation therapy platform. "With the introduction of TomoDirect™ we will have increased flexibility in choosing the best treatment technique for each individual patient, and an increase in overall treatment capacity," added Dr. Fass. 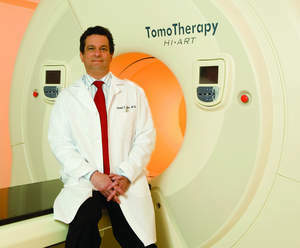 "TomoTherapy has changed the way we look at cancer care," added Dr. Fass. "Since adopting this technology, we have been able to treat many patients we simply could not have treated before -- those with complex disease, or those who may have received radiation previously. TomoDirect™ lets us expand the reach of this cutting-edge technology, designing an even more optimal plan for each individual patient, depending on their unique anatomy and clinical needs." The TomoTherapy™ treatment system is unique among radiation therapy devices in its computed tomography (CT) scanner-based design. The system allows clinicians to efficiently acquire a low-dose helical CT image immediately prior to each daily treatment, to help ensure precise patient positioning based on internal anatomy. Then, using the same equipment as used in imaging, the treatment team can deliver highly-precise radiation in a continuous, 360-degree pattern using the TomoHelical™ delivery mode. The TomoDirect™ delivery mode facilitates a non-rotational delivery option that enables clinicians to quickly plan and deliver advanced TomoTherapy® radiation treatments with a series of linear beam paths, rather than a single helical delivery path, thereby improving efficiency in the treatment of more routine cancer cases. One common database is used throughout the TomoTherapy® workflow, from treatment planning and optimization; to image guidance and treatment delivery; to record and verify; and the simple adaptation of plans. The planning workstation, operator console, treatment unit itself and a powerful computing cluster are each directly connected to the database. Because treatment plans are saved to this central database, from where the radiation delivery system reads and carries out the instructions for beam production and collimation, no operator-controlled transfer of treatment delivery data is necessary. This minimizes the risk of data corruption and loss. Dr. Daniel Fass, director of the Institute for Image-Guided RadioTherapy in Rye, N.Y.